"...And Then There Was - One!" Welcome back, Fab Fourophiles! You didn't think we would abandon you with three-quarters of Marvel's first family at death's door, did ya? That would have left you raging at the heavens, much like the Torch on the John Byrne/Joe Sinnott cover. The mistitled "..And Then There Was - One!" 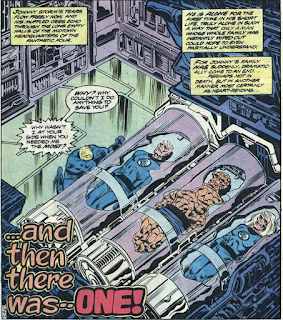 opens with Johnny Storm on his knees before his teammates, sealed in the cryo-crypts keeping them alive - barely - from the effects of the Skrulls' aging ray (FF #206). Lots of wailing and gnashing of teeth before Johnny decides that, while he's not smart enough to figure out a way to save them, others could! He calls Stark Industries, but Tony's incommunicado. He looks for Stark's "bodyguard Iron Man" at Avengers Manse, but Jarvis advises that Earth's Mightiest are "off on one mission or another," but suggests Stark might be hanging with SHIELD. Off Johnny blazes, promising Jarvis a cookie if the lead pans out. "No nuts, sir," Jar requests. "I'm allergic to nuts." It's a small, smile-worthy joke, but such has been the lack of humor under Marv's stewardship that when I read it, I had to check the credits to confirm Wolfman's authorship. Aboard SHIELD's "flying hover carrier" (try helicarrier, Marv), Dum Dum Dugan hips Johnny that, yeah, Stark's aboard, but he ain't going anywhere for at least 24 hours: decontamination time from the pool of radioactive waste Tony's trying to convert into a fuel source (a big pool of radioactive waste aboard an aircraft? What could possibly go wrong?). Pre-mourning his teammates, the Torch flies back to the Baxter and brainstorms dialing up Xandar for tech support. Princess Adora takes the call, informs Johnny there's no known cure for the Skrulls' aging ray but offers to tap the awesome knowledge of the Living Computer! And then... the call drops! Damn you (insert phone carrier of your choice)!! At wick's end, Johnny's anger ignites a dazzling light show, illuminating the top of the B. Building and the sky above. The citizens below recoil in terror or grumble about unsafe supes, but the Torch's pyrotechnic eruption inexplicably does zero damage inside, as Marv has other aliens to fry. 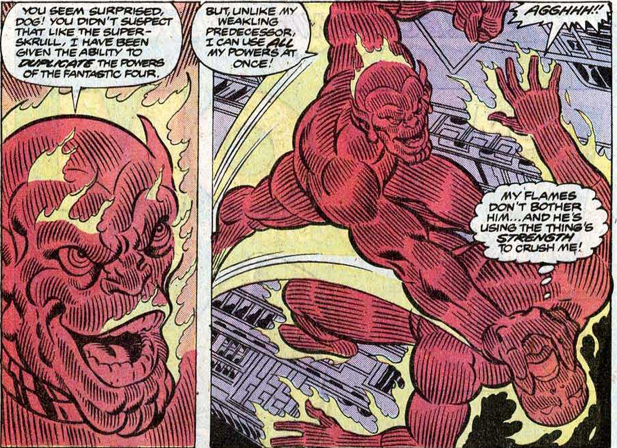 Flaming off, Johnny tries to think "calmly, rationally," even as the computer by the wall behind him morphs into its genuine form: "Skrull X," a robo ringer for the Super Skrull, who followed Adora to New York, back in #204. A two-page flaming fracas ensues, then Robo Skrull calls on the Torch to "submit...to the same tortured fate your fellow teammates have suffered!" as he pulls an aging-ray pistol from a hidey hole in his shoulder. This pisses the Torch off bigly and he turns Robo S into a steaming slag-pile. After a couple poor me panels, Torchie shakes it off, plucks the pistol from the floor with the hopeful theory that "whatever the components of that ray are...they can be analyzed and...reversed." 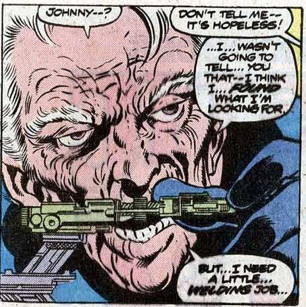 Knowing hi-tech gizmos ain't his forte, Johnny reheats Reed from the cryo-freeze, his brother-in-law's decrepitude vividly rendered by John Byrne. Coming groggily to life on p.18, Reed is like an ancient, stretched-out rubber band found in an old desk, suffering a sort of body incontinence, all loose and floppy, while his dried-fruit face approaches mummification. But Reed's brain ticks on like an expensive Swiss watch. One squint of a cataracted eye at the ray gun's guts under magnification and he has a fix, one requiring Johnny to do some micro-welding on Skrull tech "smaller than computer chips." Byrne gives Johnny welding goggles and plenty of facial sweat beads, and then, by Stan and Jack, he's done it! 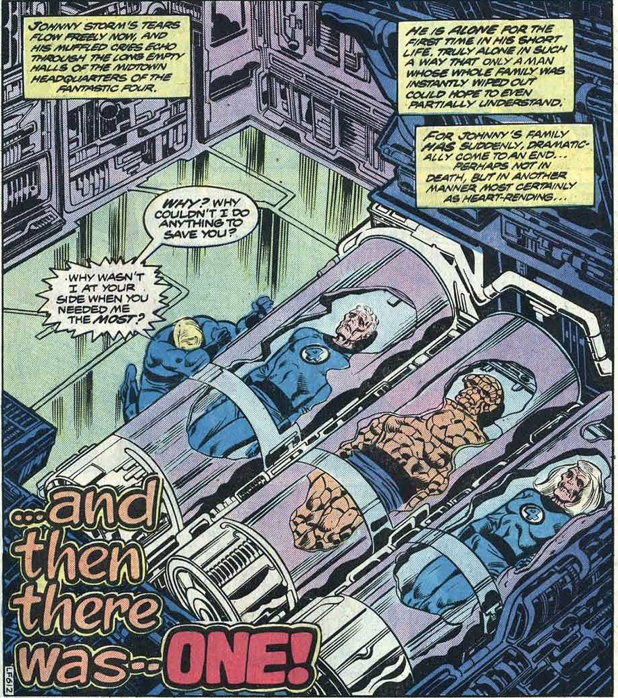 After returning still-saggy Reed to Frigidaire repose, Johnny fires the reverse-Skrull ray at his slumbering pards. "I - failed! I failed" Johnny wails, Wolfman's ladling out the self-loathing - "When the chips are ready to be cashed - when it all depends on Johnny Storm to carry the ball - I blow it!" The Torch turns the ray-gun into molten goo and wanders up to the airship garage, tortured by a floating-head rogue's gallery and the lash of his own self-abasement. Finally, after the Torch brands himself "a born loser!" his now-rejuvenated teammates make the scene. "There was a delayed reaction, lad," Reed announces. And not only that, but the boomeranged Skrull tech has made them younger, more vital than ever! Sue gives her bro a peck on the cheek. Ben picks up a giant whatzit with one arm. Reed loop-de-loops his body like a Hot Wheels track. We close with the classic stacking of four hands, straight outta FF #1, and the battle cry, "Look out world!! The Fantastic Four are back!!" 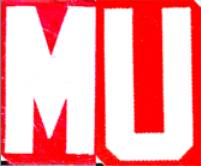 Mark: In my almost four years on the MU faculty, this is the only comic I read cover to cover twice. 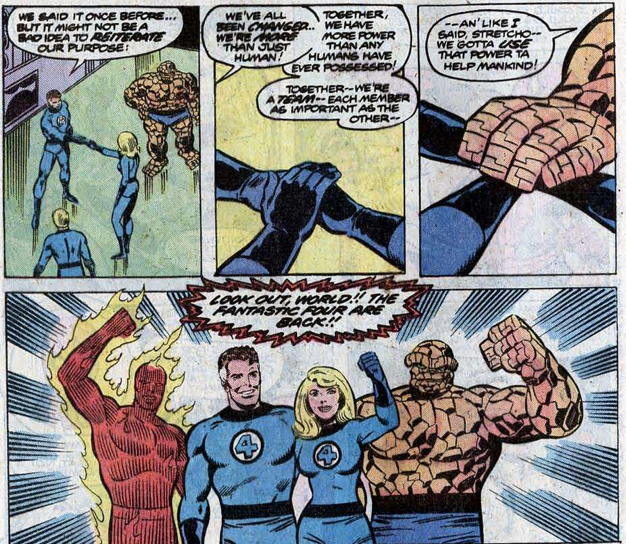 Our final lesson of the last semester, examining FF #213, resolved one plot line with Galactus' satisfying smackdown of the up-powered but under-written Sphinx - but #214 got a quick read as well, so as not to leave any of you adangle over the accelerated-aging fate of three-fourths of the Fabs. 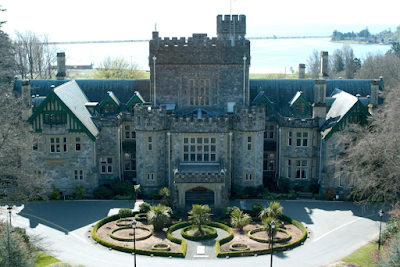 When the Dean decided the denouement required a post-grad examination, I read it again, largely to my dismay. I couldn't, second time 'round, ignore the woesome pity-party that passes for characterization in Wolfman's unsteady hands. When Johnny's not fighting, he's crying. Now a bit of raw emotion is fine, given that his family and fellow Fabs are near death and the Torch feels guilty for being a.w.o.l. against the Skrulls (see Security University/College fiasco); fine, pathos and all that, but when Johnny's actively engaged in saving his pards - as he is throughout the rest of the story - it should buck him up a little, but instead, every time he gets to pause for breathe, it's back to the sell-flagellation. On exiting the Helicarrier, Stark-less, p.5, "If anyone should be dying, it's me!" "I'm the useless member of our quartet." "I'm the one who never pulls his weight. And now it looks like I'm gonna fail for the very last time!" Alas, no salvation for us, class, as on the very next page, while lighting up the Manhattan sky with his impotent rage flare, Johnny yelps, "Why? Why are the fates plotting against me? Why? Why? Why?" Okay, give us a Valium. 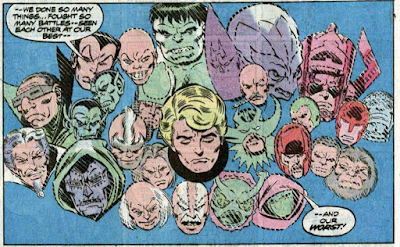 Fortunately, the action in the middle third of the book - energetically wrought by John Byrne and Joe Sinnott - limits the whining, but when the reversed Skrull ray fails to instantly revive the senior-cycles, Johnny barks, "I failed!" follow by two entire pages of self-loathing soliloquy, larded with gems like "I'm nothing more than a glorified match-stick!" 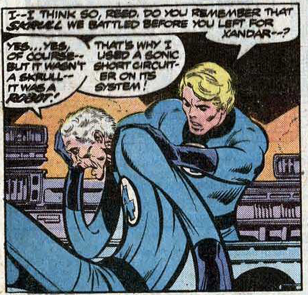 before his revived teamies finally show up - a bit younger then they were before, in one of those minor, status quo tweaks - like Reed's expanded stretching power, which I think happened around ish #200; hey, at least I remember it at all, unlike Marv - that will soon be forgotten. Everyone now hale and healthy, we exit with some forced rah-rah. 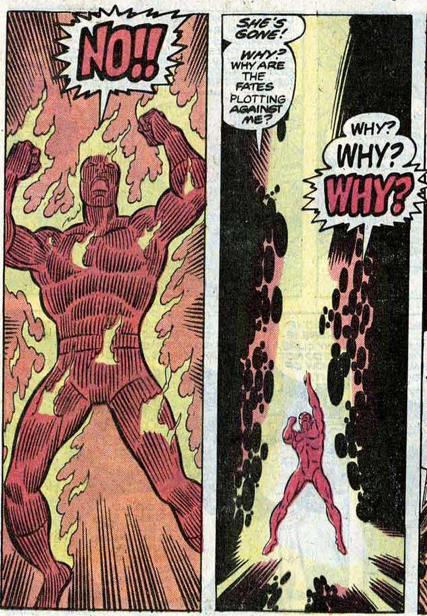 So, no, kids, I don't really believe the FF are back, but after Wolfman's malignant mishandling of one of my fave characters, even in a starring role - he's a hero, but boy, what a sad sack! - I'll take all the phony triumphalism and four-way hand-stacks I can get. But let's conclude on a positive up-tick. Two, in fact. 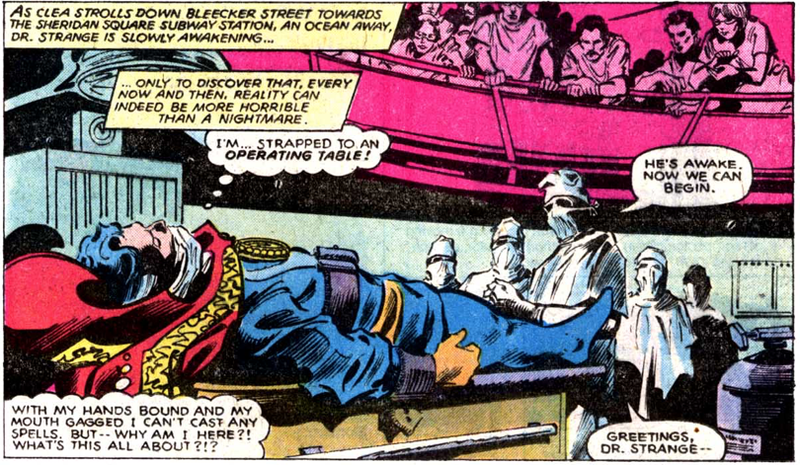 From the evocative cover (happily, dialogue free) to the last panel power salute, the groovy graphics rock. 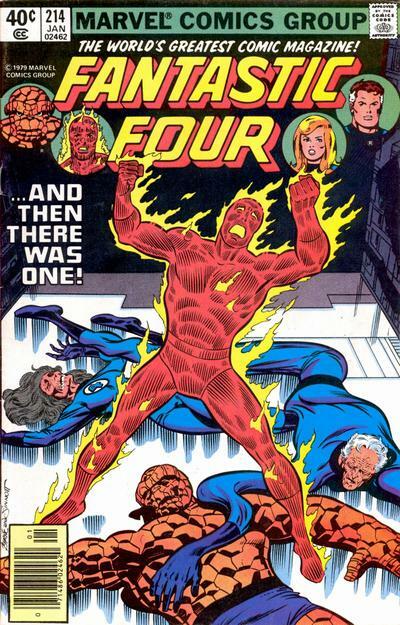 Joltin' Joe's the title's iron man since FF #44 (bonus points for students who know about #5), and Byrne brings both his burgeoning talent and passion for the Fabs to the pages. 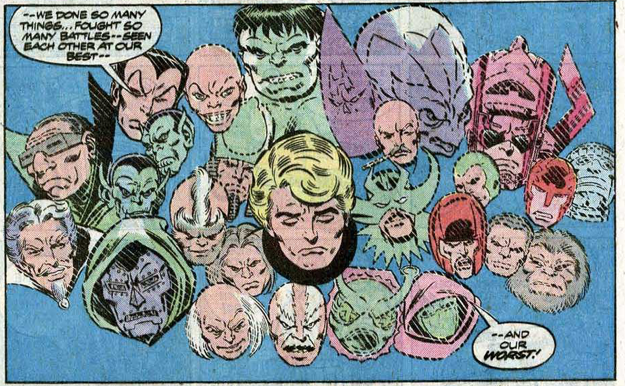 Second, and more importantly, I was considering reading through the rest of the FF's 1980 canon, perhaps to be reported upon in chunks, but have now been thoroughly disabused of that notion. Maybe we'll be back when Byrne takes over the whole shootin' match. Matthew Bradley: I had hoped that after a breather, and absent the pressure of our erstwhile weekly deadlines, I might tolerate this a bit better, but Marv’s maundering annoys me as much as ever, most notably his mishandling of cover-boy Torch. 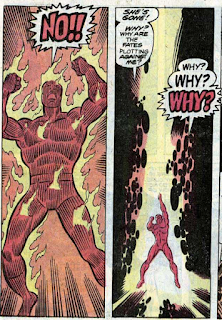 We’ve already had an extended Johnny Storm pity party, which is why he bailed on the Xandar mission, which is why he’s the only one not superannuated now. And what is this nonsense about him being “the useless member of our quartet…the one who never pulls his weight”? I like Sue, frequently think her underutilized, and would never want to be sexist, but I seriously doubt that anybody who had more than a passing familiarity with this book would say Johnny consistently made the least contribution to the team. And there, per Hamlet, is the rub. Read my lips, grad students: this is out of character. Johnny has always been the brash young, yes, hothead, self-confident or, frequently, overconfident, and did I miss the part where Sue had her own 34-issue solo strip in Strange Tales (crappy though it might have been) because her little brother was such a slacker? This just reinforces what I have been saying all along about Wolfman’s tin ear for the strip and its characters, and of course the maddeningly inevitable corollary to all of that is Grandpa Reed’s pathetic gratitude when the Flaming Mope—shocker!—rises to the occasion and saves the day, well, sorta: “You did it, son…you did it….Th-thank you, lad…th-thank you.” Yes, kids, the FF is now led by Porky Pig. Claremont's final days on Doctor Strange! I always liked Wolfman, but I never read his FF or Nova. Is this really so bad? Johnny as the eternal hothead was as boring as Reed in his condescending ways after a while. But Johnny never was a whiner, it sounds absolutly out of character. But the art looks nice.